The compact and powerful UE Boom provides excellent sound quality, long-lasting battery life, easy portability plus water resistance for peace of mind at any party. A portable Bluetooth speaker lets you party anywhere — but being portable means it has to do a great job reproducing high-quality tunes while remaining small and light enough for easy toting. It needs to be easy to pair with your music device. It should be able to withstand incidental bumps and jostling, and it would be great if it were impervious to the elements and other aquatic encounters. 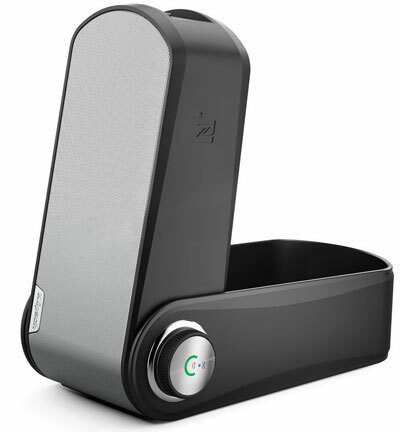 A portable Bluetooth speaker should let you carry on hands-free phone conversations. It should be easily charged and supply enough juice to provide a steady soundtrack for even the lengthiest bacchanalia. And it needs to put out plenty of sound; it needs to be loud. We considered the range of Bluetooth speaker uses and a need for superior sound indoors and out, and a clear winner emerged as the ultimate high-end ($200+) choice: Logitech's Ultimate Ears BOOM Wireless Bluetooth Speaker. We awarded the Boom our top finish after running other highly-rated premium Bluetooth contenders through their paces. We tried out the highly regarded, book-sized Bose Soundlink III ($300), the distinctive yet bulky Polk Camden Square ($300), the vaguely wedge-shaped Klipsch GiG ($200), the psychedelic but tragically underpowered JBL Pulse ($200), the adorably tiny and appropriately-named Beats Pill 2.0 ($200), the oddly rhomboidal Bayan Soundbook X3 ($300), the fun yet even more underpowered Fugoo Style ($200), the colorful and bass-laden Jawbone Jambox ($300) and the water- and shock-resistant Braven BRV-X ($200). Each Bluetooth device features something worth recommending it, either aurally or ergonomically, and sometimes both. Sound quality, of course, must remain our primary interest. To test these speakers, I used an HTC One M8 to listen to both bass-laden and fragile tracks including "I Gotta Feeling" by the Black Eyed Peas, the uncensored version of Pink's "Less Than Perfect," "Tubthumping" by Chumbawamba, "Money" by Pink Floyd, "Here Comes The Sun" by the Beatles, "Rolling in the Deep" by Adele, "Life During Wartime" and "I Zimbra" by the Talking Heads, "Woke Up This Morning" by the Alabama Three and "In Your Eyes" by Peter Gabriel. Overall, the Bose and Polk Camden Square stood out, producing the most natural and even tones across all frequency ranges. The Klipsch GiG and JBL Pulse produced the crispest, most full-range tonality among the more compact units. But the Boom wasn't far behind these audiophile favorites, with differences perceptible only through critical side-by-side listening. The Boom boasts distinct, smooth and natural mono sound indoors and out and at all volume levels, with solid, unobtrusive bass. Thanks to its 360-degree speaker design, the Boom provides a surprisingly wide soundstage that isn't as location-specific as flatter speakers with sound stages and even volumes dependent upon their placement. No matter where you put the Boom in a room or in what position — optimally standing upright or horizontally — it sounds the same. Outdoors, the Boom, Bose and Bayan put out the most volume at the longest distances, but the Boom has the greatest space-filling potential. Then there's the disappointing case of the JBL Pulse cylinder, perhaps the sweetest-sounding speaker with the best-defined bass of all the compact units. Unfortunately, the Pulse not only lacks its own built-in volume controls, it produces only enough volume for an intimate gathering. Its sound (as well as the Fugoo's) would be completely drowned out in any well-populated party situation, although the crowd might be mildly entertained by its gimmicky, pulsating LED light show. However, a Pulse with a slightly more powerful amplifier might come closer to perfect than any other speaker we tested. All Bluetooth speakers except the Beats Pill maintained solid Bluetooth connections out to about 80 to 100 line-of-sight feet — in most cases far beyond their effective aural range. The Beats' connection, however, started to garble at around 70 feet. AptX is a new compression scheme designed to smooth out the rougher tonal edges of Bluetooth connections, which really aren't designed for music. Geoff Morrison at CNET provides a great primer on aptX. Because the technology is not supported by Apple, we used an aptX-equipped HTC One Android phone for our tests. The Boom lacks aptX compatibility — but the Boom sounded superior to most of the aptX-equipped speakers we tested. Only the Beats Pill and Fugoo are smaller. The Boom is IPX4 splash-resistant, handy not only for inclement weather or beach and swimming pool splashes but to withstand thorough cleaning and even spilled drinks at parties. Like all the compact models noted here, the Boom charges via a micro-USB connection using the same charger or portable power pack as your Android phone. All the larger speakers use speaker-specific pin-type jacks. It runs for 15 hours at half volume, an above average time for premium Bluetooth speakers; only the Polk Camden Square (24 hours) and the volume-challenged Fugoo (40 hours) are rated to run longer. With an output of 88 decibels, in my decidedly unscientific tests, the compact Boom surprisingly proves to be one of the loudest models I tested. Like most of the other speakers, it includes a built-in mic so it can be used as a speakerphone. Each of the Bluetooth speakers I tested offered some combination of these features and capabilities, but no other portable Bluetooth speaker brought together the Boom's combination of high sound quality and bass indoors and out with volume level, water resistance, battery life and size and placement versatility. We are not alone in giving high marks to the Boom. CNET's reviewer was impressed by how loud it played and how long its battery lasted. "I still wished it cost a little less," wrote the CNET reviewers, "but in taking it for a weekend spin outside the office, I found myself becoming attached to it — enough to think I wouldn't regret paying $200 for it." Over at PC Magazine, Will Greenwald said the Boom gives "solid, room-filling imaging regardless of its placement or your listening position," noting that he had yet to find a speaker the Boom's size that put out as much sound. Matthew Miller at ZDNet compared it to the Beats Pill, Jawbone Jambox, and Braven 650 and called the Boom best of all. And Pete Pachal at Mashable advised readers to forget Jambox: "It's officially been replaced, at least to my ears, by the Ultimate Ears Boom: a portable wireless speaker that sounds almost as good as a much larger home system." Amazon customer Cjfilm spoke for many when reporting he'd returned his Jambox in favor of a Boom after noticing its rich, deep sound. "I compared it to the big Jambox and UE Boom still sounded louder and better overall — even better than the JBL and Bose speakers." At only 2.6 inches in diameter, the Booms fits anywhere a water bottle can fit, making it incredibly convenient to tote. Only the Beats Pill is more convenient to carry. And, the UE Boom comes in a variety of colors to match your decor. The Boom can even be hung like a lantern via the D-ring on its bottom. Dangled from the ceiling above a party crowd, the Boom becomes even boomier than a speaker placed waist-high on a tabletop. If you want stereo sound, you can link two Booms together wirelessly via the UE Boom app (free at iTunes and Google Play), then place the wide enough apart to provide soundstage and separation. Only the Beats Pill also offers this two-speaker stereo option. Alternatively, two Booms can be wirelessly linked to double up dual mono sound, an option no other speaker offers. Twin Booms at opposite sides of a party space ensures every corner is filled with song. If you're somehow dissatisfied with the Boom's bass — and these small speakers aren't exactly subwoofers, after all — the Boom app provides four EQ settings: a default Out Loud, Vocals for dialog-centric sounds, Intimate for close quarters and, most importantly, Bass Boost. The UE Boom app also includes an alarm feature that produces louder wake-to-music sound than your smartphone alone, another feature none of the other Bluetooth speakers tested here include. You might be able to find Bluetooth speakers with a slightly better sound, boomier bass, more weather resistance and longer-lasting power, but in our opinion, none are more versatile and more successfully combine all the critical Bluetooth speaker criteria into one compact package than the UE Boom. If sound quality is your top criteria in a compact portable speaker, our recommendation is the Klipsch GiG. The GiG boasts the best sound-to-size ratio, with a robust and wide soundstage despite its diminutive dimensions. Its odd wedge shape makes placement almost as insignificant an issue as the Boom's 360-degree design. The GiG is among the loudest speakers we tested, pumping out the best-defined bass with no clipping or distortion at top volume. Ergonomically, the GiG is the only premium Bluetooth speaker with a volume knob rather than up/down buttons, intuitively and conveniently placed right on top of the unit. Its power toggle, micro-USB port and 3.5mm auxiliary jack are hidden behind a swiveled frame that doubles as a stabilizing stand. The GiG's odd, Flatiron Building shape and weird swivel frame keep the GiG from being as conveniently portable as the Boom. It's not water-resistant, so it can't go as many places as the Boom. Oddly, I had a devil of time turning it off, a strange problem I also encountered with the Beats Pill. All in all, the GiG delivers the highest quality sound, loudest volume and most defined bass in the smallest package, limited only by its bizarre shape and the conditions and environments you can use it in. How about home office speakerphone? As a remote worker, really interested in best bluetooth, etc home office speakerphone for conference calls, etc. Would be great if good at music too, but . . . I found the mono speakers, such as the UE Boom, did a nicer job with voice than the stereo speakers such as the Bose or the Klipsch. The stereo versions tended to spread the voice across a wider soundstage, which was actually a bit distracting and, in some cases, seem to overwhelm some of the speakers – a bit of distortion at the high end – since they are optimized for music, not voice calls. The UE Boom, however, seemed to handle voice quite well. However, for home office use, you may want to consider a speaker better designed to stay plugged into AC and small enough to be unobtrusive on your desk. For this, I’d recommend one of the Soundmatters FoXL (http://www.soundmatters.com/product/foxl-v2-2/) models, which are great for both voice and music. Thank you for the response! Most appreciated and will check out the soundmatters now! I like to play list you put together to run the gamut from bass-heavy to delicate highs. Well done! There are very good affordable products, like the Oontz you mention. And, we will have another story story soon with our pick for the best portable Bluetooth speaker under $100. So be sure to check back . Hard to believe that the most compared to Bluetooth speaker (Bose Soundlink Mini), was not included in this test. We didn’t consider the Mini primary because it provides only around 7 hours of battery life, around half the play time of other systems at the same price we tested. The lowest battery life among the systems we tested was 10 hours. For a portable product, we believed battery life was a baseline consideration. Another disadvantage of the Bose Soundlink Mini is that it does not have speakerphone capability. Do all the ones tested have this capability which is highly desirable fir conference calls? All other speakers in this roundup include speakerphone capability except the Polk Camden Square and the JBL Pulse. What a wonderful selection of songs to test the speaker quality! I am compiling this play list right now for my own use. Thank you for the comprehensive review. I look forward to the review of the speakers under $100 coming in the near future. Cheers! Could you tell more about the fugoo volume? 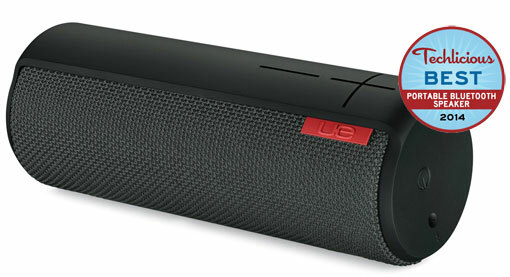 I hear it sounds much nicer than the Ue Boom, but the Ue Boom is much louder. I had a Jbl Charge and its volume was enough for my need. Is the Fugoo much quieter than that, even efter the firmware update? I don’t know that a firmware update can change the underlying hardware that controls how much volume a speaker can put out. The Fugoo was noticably quieter than the other speakers I auditioned; hard to quantify subjectively, but objectively, the Fugoo outputs only 6 watts, and the JBL Pulse puts out 12 watts, and the Pulse is also noticeably quieter than the UE Boom and the other speakers (UE didn’t supply a power rating, but the Klipsch GiG, which has comparable volume as the UE Boom, albeit stereo, puts out 20 watts). So, you could say the UE Boom is around three times as loud at top volume. They actually released a firmware update in july that brings a “Loud Mode” option, that somehow increases its volume and its sound quality. Sure it probably still faces hardware limitation, though. I looked for a portable bluetooth speaker and I UE Boom like the best in his category. After bying it, I heard about Fugoo. Returned the Boom and bought the Fugoo. First, for my non-audiophile ears the sound of the Fugoo is much better. FYI, The lowest JBL PUlse can go is 100hz (you know… the bass), the Boom can go til 90hz, while the Fugoo has a 60hz minimum. You can keep your “solid (100hz) bass” and the money u got from Logitech. I’ll go with the Fugoo. “Best-defined bass” has nothing to do with MOST bass – if I had meant “most bass” I would have SAID “most” bass. “Best-defined” means the bass didn’t overwhelm the rest of the sound as it does on many other speakers that simply pile on MORE bass. As in all things, it’s not how much you have of something, but how you use it. IMHO, the JBL did the best job of smoothly integrating its bass into its general soundstage. That is my opinion. What is demonstrable FACT is the lack of volume in the Fugoo compared to every other speaker I tested – the Fugoo only outputs 6 watts of power vs. 12 for the JBL and 20 watts on most of the others. But if you like the Fugoo, good for you. It’s a popular speaker and I found only its lack of volume to be a comparative issue. You are certainly entitled to your opinion and your buying choice. What you are not entitled to, however, is your casual accusation of bribery on my part. My editors have given me permission to take you to task in no uncertain scatological terms, but I will instead try to remain on a high road. Just because you have an opinion that differs from someone else’s does not mean the other person is on the take. The idea that a consumer electronics company would even attempt to bribe a reporter for a good review on a product as relatively insignificant as a Bluetooth speaker is laughably ludicrous on its face and merely displays an astoundingly thoughtless ignorance on your part. I’d consider your accusation an insult as well as a legally actionable libel (which it is), but that would imply that I respect the source. Great review, and great response. Thanks for this review. I am currently using TDK Trek A34 and regularly while playing tennis. It is a single open court where loudness is important using sports-themed spotify playlists (e.e. Best Guitar Solo playlist). Problem is the 4hr battery life of TDK (15watts) when volume is at max. I am now considering both Soundlink 3 and Polk. Both at a seller in my country where audition is not allowed, Polk is priced $50 US more than Bose. Based on your test, which of these two is best suitable for my environment? Easy – both are plenty loud, but the Bose SoundLink III is much smaller and easier to tote than the bulky Polk, which is around than twice the Bose’s size. You can also buy optional cases for the Bose that will protect it from the elements. I enjoyed your article, and have auditioned a few of the speakers listed - with the exception of the Bayan, Polk, and Braven. I am not overly fond of Bose as a rule - however, the Soundlink III had far better high frequency response than any other Bose product I’ve yet to audition. I have yet to purchase any seriously portable Bluetooth speaker. I like the Harman/Kardon Onyx Studio - and so I purchased it. However, as I am certain you are aware… it’s not a good choice for outdoor/all-weather listening. I’m interested to read, should you feel inspired to write again. These are 2 really good Bluetooth speakers but to be fair they are quite pricey. I’ve owned portable speakers that are half the price of the UE Boom that sounds just as good and to be honest if you did a blind test I’m pretty sure most people wouldn’t be able to tell the difference. I would suggest two more portable speakers that we should give them a try. They are Bose SoundLink Mini II and Sonos PLAY:1. Both are good enough to play your favorite music at home.